The development of literature between 1800 and 1860 in the United States was heavily influenced by two wars. The War of 1812 hastened the development of nineteenth-century ideals, and the Civil War uprooted certain growths of those vigorous years. The half century between these dramatic episodes was a period of extravagant vigor, the final outcome being the emergence of a new middle class. Parrington argues that America was becoming a new world with undreamed potential. This new era was no longer content with the ways of a founding generation. The older America of colonial days had been static, rationalistic, inclined to pessimism, and fearful of innovation. During the years between the Peace of Paris (1763) and the end of the War of 1812, older America was dying. The America that emerged, which is the focal point of this volume,was a shifting, restless world, eager to better itself, bent on finding easier roads to wealth than the plodding path of natural increase. The culture of this period also changed. Formal biographies written in this period often gave way to eulogy; it was believed that a writer was under obligation to speak well of the dead. Consequently, scarcely a single commentary of the times can be trusted, and the critic is reduced to patching together his account out of scanty odds and ends. 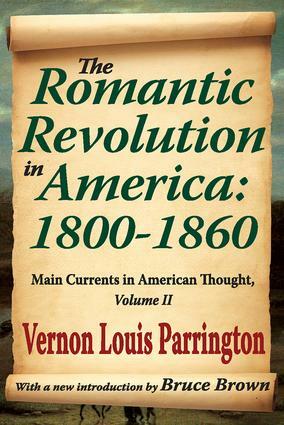 A new introduction by Bruce Brown highlights the life of Vernon Louis Parrington and explains the importance of this second volume in the Pulitzer Prize-winning study.